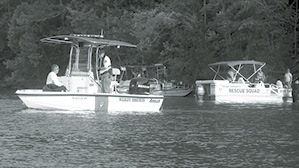 The start of the July 4 holiday period took a tragic turn Saturday afternoon when authorities were called to the scene of an incident on Dale Hollow Lake where one victim had apparently jumped into the water and never resurfaced. According to information obtained from the Pickett County Press in Byrdstown, the victim was 23 year-old Ryan Seaton, of Ohio. The investigation indicates that he was not wearing a lifejacket at the time. The incident occurred at mid-afternoon Saturday when authorities were dispatched to the Shear Pin Pass area of Dale Hollow Lake in the vicinity of several rock cliffs along the bank of Shear Pin Pass which is a popular gathering spot on the lake. Officials with the Tennessee Wildlife Resources Agency (TWRA) were on hand throughout the afternoon Saturday, along with boats and crews from both the Pickett County and Clay County (Tennessee) Rescue Squads. The rescue squad units searched unsuccessfully for the victim’s body until about 10:00 p.m.
After resuming the search on Sunday morning, the victim’s body was recovered at about 9:45 a.m. The rescue squad personnel from Pickett County told the Clinton County News that the body was recovered in 37 feet of water. The location of the drowning is in Pickett County, Tennessee, near the boundary with Clinton County, Kentucky and is situated about two miles from Wolf River Dock. Officials from several agencies were on the scene of a drowning incident at Dale Hollow Lake this past weekend. According to reports, an Ohio man jumped from a rock cliff in the Shear Pin Pass area, and never resurfaced. Rescue squads from Pickett County and Clay County Tennessee searched the waters for the victim until about 10:00 p.m. Saturday. The body of the victim was recovered when the search resumed Sunday morning.